Big Squid RC Smash and Bash FAQ – Get The Answers Here « Big Squid RC – RC Car and Truck News, Reviews, Videos, and More! Have some questions about the Big Squid RC / Hobby Town St. Charles Bash that’s happening? Well we have the answers to your Frequently Asked Questions! As with anything, things can change, but at the moment, these answers are as accurate as we could get! Still have questions? Feel free to drop us an email or stop by the Hobby Town St. Charles Store. Saturday, June 17th, 2017 – Registration starts at 10am, events start at 11am! St. Charles Hobby Town – 2061 Lincoln Hwy A, St Charles, IL 60174 Google Maps and Waze will both get you there! $10 per person gets you registered and 1 raffle ticket. It’s outside! Bring sunscreen. Right now the weather is iffy, they are calling for rain late in the day, but fingers crossed we can get all the events done before it rolls in. It’s the Chicago area, ANY weather can happen, and it’s usually not what they predict. Will the event happen if it rains? Right now, the weatherman says we may get rain later in the day. Most vehicles are waterproof these days, this is a bash, we are bashers.. get out there and have fun. If it’s crazy lightning or something.. no.. but some on and off drizzle never hurt anyone. Yes and no. The awesome HobbyTown folks will have a table with about 6 chargers out there to charge packs, but we highly recommend bringing enough charged packs to get you through the day. You are welcome to bring a mini generator if you like. Most people won’t use more than a couple of battery packs for the entire day’s events. Try to be prepared. Heck yea! There will be a food vendor type thing that will have breakfast dishes, sandwiches, pulled pork, chicken, hot dogs and more! Come hungry! For the last few years we have been donating all profits to St. Jude Children’s Hospital. Last year we donated $1450! Lets top it and help some kids! Are there prizes? Anything good? Yes and YES! Every paid entry gets a raffle ticket. You can buy more raffle tickets if you want, but you must be a participant, and must be present to win! Right now in the raffle is a Traxxas TRX-4, Dromida MT, Dromida Buggy, RC4WD Gelande II, ARRMA Outcast, Pro-Line Racing Wheels/Tires, Traxxas Swag, RPM RC Products and MORE! We also do a live auction where you can win Pre-bashed vehicles. Stuff we have reviewed, bashed, and don’t have room for. People get some AMAZING deals! So if you don’t win in the raffle, you still have a chance at getting something sweet! Yep! The folks at the Hobby Town St. Charles are offering up some AMAZING deals! 10% off ALL in-stock RC Vehicles, 50% off refurbished Dromida Vistas, and a few other crazy specials we have been hearing about. What scale vehicles are allowed? We normally try to promote 1/10th and 1/8th scale short course and monster trucks at these events, but you know us, run what ya brung! We have had a bunch of requests for X-Maxx and 1/5th scale’s to be allowed, so we have a large bash area for those guys to play, and we will also be trying to run them in their own class of events. No guarantees we will get them in all the events, it’s a busy day, but we will try! Are there tables and chairs? There may be a couple, but not many, so we recommend bringing your own tables and chairs. Some people just pit out of their cars/trucks. Do what you need to do. 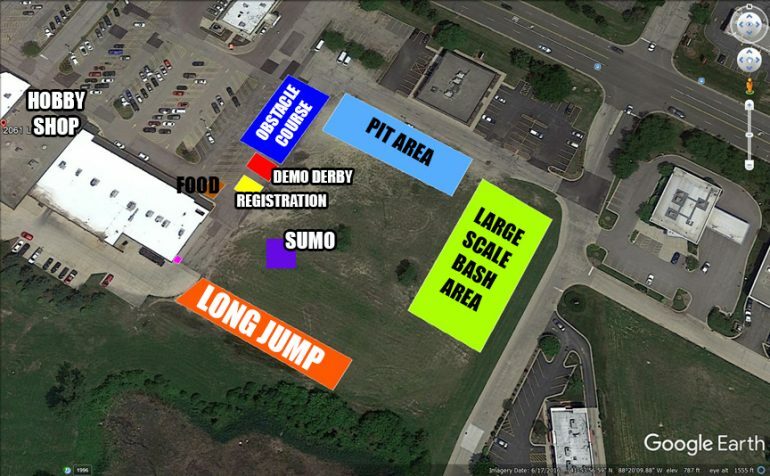 Long Jump, Obstacle Course, Demo Derby, Sumo Table, and maybe a couple of other things. Remember, some of these events are not kind to vehicles so there is a hobby shop 100 feet away. 😉 You do NOT have to participate in all the events, but we recommend that you do. They are all fun! This isn’t super competitive, we are just out here to have a good time. Come out and have a good time! Bring a friend! Tell all your friends! Help spread the word about the event! Please link on all your social media favs. Play hard, but play safe! Check back here in case we forgot something and need to update/add it.